Perhaps John knows what body and model this is. 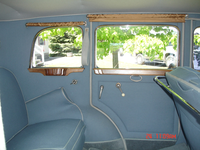 1931 Reo Royale Eight with 8 1/2 x 24' enclosed trailer. 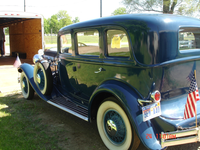 Previously owned by Richard Zebolksky Sr. His children are selling his car and trailer as a package. For info, please call Connie 260-226-0927. Leave message and we will return call. 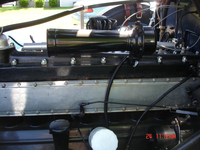 Have a leaking water pump on a 1925 REO 4 door touring sedan. Unclear and New to REO. 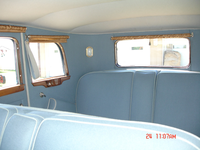 It has three side windows on each side and Suicide door on the rear. 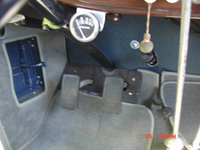 Motor is a 6 cyl with Aux equipmet like wtr pump- Gen and dist all on drivers side.Two rag joints in-between. I assume the pump needs to be cleaned up and repacked. So I am on the hunt for the packing or advice otherwise. There is Dan Koehler in Wisconsin 920 221 0427 . Dan is a retired machinist and has fixed Royale and Flying Cloud and T6 water pumps with new ceramic seals . I know when I had my T6 I had to install new water pump shaft in it . This car is for sale in this month's echo. I have a set of REO parts for sale. I have an engine, headlights, fender, steering wheel, radiator, wheels and tires and much more. I am unsure of what year or model the parts are for but feel free to contact me for pictures and more information. Carb, now including cap and rotor. Elgin Car Clock for 1931 REO Royale, I have the aperture that it mounts in, as well as the small engine gages, I just need the clock. 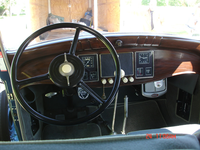 Interested in a REO Royale, will intertain any condition from untouched barn find to restored. 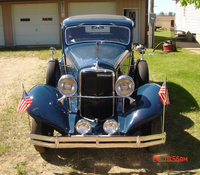 My late grandparents drove my great grandfathers while they were dating in 1947, would like to have one for myself now... Too late to ask them now exactly what body style it was believe coupe or Victoria, I just remember stories from when I was a kid. 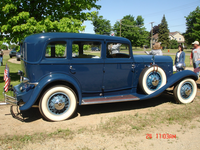 Before the Royale was a flying cloud coupe, so he was certainly a REO man. Any leads appreciated. Thanks! I posted in introductions as well. For Sale Reo Royale parts . I am not sure of the year . Any Royale experts out thee ?